What an amazing final day at The 2016 Open. The final duo of Phil and Henrik provided us with some of the best golf you’ll ever see. Henrik was a very worthy champion. His ball striking was simply superb! Combine that with great putting and you have the key for very, very low scores. When I was watching the final round one of the commentators stated that us “average” golfers couldn’t learn anything from these two golfers because they are just too good. See how his head is moving (swiveling) towards the target from the moment of impact and beyond. Look, if you have some notion that you should keep your head down when you swing through the ball… DON’T! Henrik Stenson is one of the best ball strikers on the planet, and he lets his head turn with the ball as it’s being struck. Why would he do that? Because it allows a free, powerful move through the ball. If you are unnaturally trying to keep your head down as you swing through the ball then you’re more than likely to have undue tension in your body. And undue tension in your body will cause you to hit the golf ball shorter and less accurately than you would if you weren’t tense. So here’s a tip that I highly recommend you give a try the next time you’re out having a practice. As the ball is hit (or even before) simply swivel your head to follow the flight of the ball. Be careful when you do this that you don’t lift your head up. Your head will naturally move up in your follow-through without you trying to do it. What I’m suggesting here is that you let your head turn to follow the ball as it’s flying after you’ve hit it, rather than trying to keep your head and eyes glued to the spot on the ground where the ball was. You can get so bogged down in internal instructions that your ball striking will get worse NOT better. 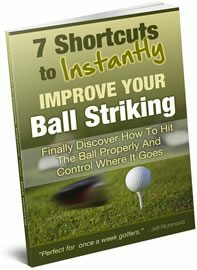 However, I discovered a very unique way in which you can copy what great ball strikers do into your own golf swing in record time – without getting technical. All of this is outlined in my ’15 Minutes To A Perfect Golf Swing’ program. 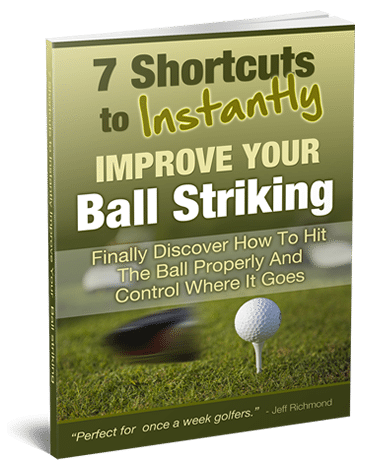 So if you’d like to take a shortcut to improve your ball striking, then go here and check out this ’15 Minutes To A Perfect Golf Swing’ program.